The Pine School has a passion for passions. We believe that natural creativity is innate, and we strive to develop it in every one of our students. We encourage creativity and offer our students a range of opportunities to contribute to our School and community through their artistic expressions. Our student-artists are supported by a dynamic team of faculty - many of them working artists themselves - and opportunities for performance and exhibition experience abound. 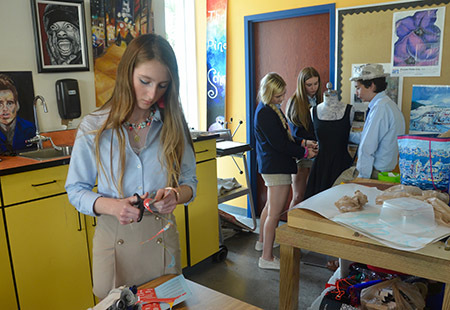 Additionally, the School has built strong partnerships with local arts organizations that provide an unique range of learning opportunities - from taking in special exhibits at area art festivals and museums to participating in hands-on workshops by professional artists. "Each student taps into his or her artistic inspiration in very individual and personal ways," shares Fine Arts Department Chair Steve Naumann. "We know how important it is to create the right setting - providing instruction on technique in an environment that encourages healthy artistic risk-taking and expression." Our student accolades in all areas of the Arts speak for themselves: National Scholastic Gold Key Medal, Excellent rating by FL Thespian Society, Top Student Visual Artist Martie Award, selected 4-County Honor Band & District MPA honors, selected for Drexel University Photography Exhibition, NPR Young Musician Spotlight, & Green School of Excellence Recycled Runway recognition. A crucial element to our Arts curriculum is providing students with a platform to share and receive feed-back on their creations. 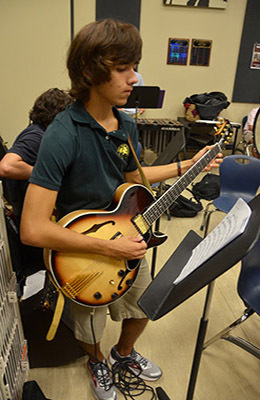 From our dedicated gallery space and regular focused exhibits to countless performance opportunities (both musical and theatrical), our students develop a life-long love of the Arts and perfect skills that will serve them for years to come. Our Recycled Runway - an unique, environmentally-friendly fashion show combining cross-curricular collaboration - has become one of our most anticipated artistic annual events. Using only recycled or repurposed materials, our designers create outfits and accessories that are as whimsical as they are practical. Photos from our latest Recycled Runway can be seen on our Flickr page.